Tomorrow is primary day, but last Friday also marked some significant yeas and nays. It was the final day for bills before the State Legislature to pass out of the house where they were introduced, also known as their house of origin. One of the big trends in legislation this year is an effort to move the pendulum back from zero tolerance in schools to something more nuanced. Starting from the top, with State Senate President pro Tem Darrell Steinberg, lawmakers introduced nine bills. As we reported in April, Senator Steinberg and other legislators were disturbed by a report called Suspended Education in California, which found that the harshest punishments were carried out with clear racial disparity. 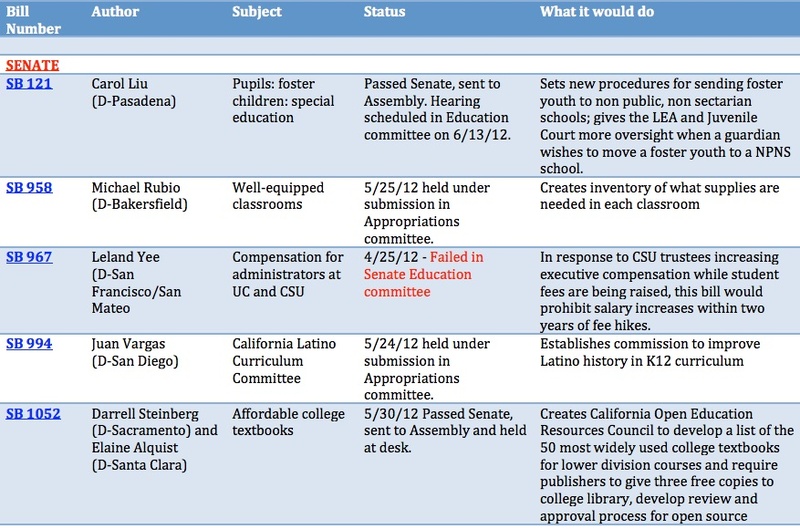 Steinberg’s bill, SB 1235, requires schools with suspension rates above 25 percent, overall or for a specific racial or ethnic group, to implement a research-based alternative that holds the students accountable for their misbehavior but keeps them in school. Sherry Griffith, a legislative advocate for the Association of California School Administrators (ACSA), finds some irony in the number of bills on the issue, and she urges caution. “Last year we were in the zero tolerance for bullying, and this year it’s okay to keep them (disruptive and angry students) on campus unless it’s critical,” said Griffith. ACSA has been fairly active this session in addressing the problem of misbehavior by teachers. The situation in Los Angeles Unified School District, in which a teacher accused of lewd acts on children was on the job for years before being removed from the classroom, has sparked numerous bills that would make it easier for school districts to take action against teachers accused of similar conduct. SB 1530, sponsored by Sen. Alex Padilla, adds “serious and egregious” conduct to the types of behavior that will get a teacher removed immediately. After a year of meetings and public hearings, members of the Community College Student Success Task Force are watching to see what happens to SB 1456, carried by Sen. Alan Lowenthal. 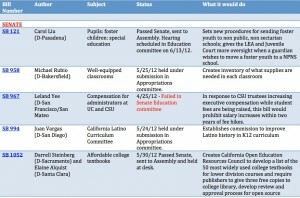 The Long Beach Democrat has introduced the Student Success Act, which begins to implement some of the recommendations in the Task Force report. The second part is a bit more controversial: It would tighten eligibility for Board of Governors fee waivers. If students fall below a 2.0 GPA for two consecutive terms, they lose their waiver. “For the first time we’re saying students need to meet satisfactory academic standards,” said Garcia. Requests for waivers have been rising along with community college fees. About 62 percent of students receive the waivers, and that could rise to 70 percent within the next couple of years.